Do you know youth (12-18 years old) in school and homeless? Sanctuary Youth Shelter helps youth in need. Youth can stay at the Shelter for up to 3 weeks while our team helps the youth search for a safe housing solution. Youth will even get to continue with school and not have to worry about a safe place to sleep. If you are a youth or know a youth in need, please call (559) 498-8543 or 1-800-820-4YOU for more information. National Runaway Prevention Month (NRPM) is a month long campaign to raise awareness of the runaway and homeless youth crisis and the issues that these young people face and to educate the public about solutions and the role they can play in ending youth homelessness. Organizations show support and awareness by participating in events to help make the public aware of the issues facing homeless youth. Sanctuary and Youth Services will be observing this month through a variety of daily activities and community involvements. If you would like to get involved in community awareness for NPRM, please call us at (559) 498-8543. Join us at a Fresno Unified School District elementary school, a designated Safe Place for youth. The event will provide holiday cheer for 30 low-income families, including over 150 children. Families will receive a warm festive meal, gifts, stockings, a Christmas tree and an opportunity to visit and take photos with Santa. Sanctuary’s Making Spirits Bright event brings together Fresno’s businesses and community groups working together to serve others. Our 2016 partners include: PG&E, Macy’s Fashion Fair and River Park, USDA Forest Service-Sierra National Forest, London Properties, and Anthem Blue Cross of California. Since 1993, Making Spirits Bright has reached 660 families, including 2,200 children residing in Fresno County. In 2016, The Making Spirits Bright Committee was recognized by Hands On Central California with the Volunteer Business Organization of the Year. For more information, visit www.FresnoEOC.org/MSB and consider volunteering or making a donation. 10 FREE sessions to learn more about prenatal care. Members of the Sanctuary Advisory Board serve to advise, guide, and advocate in all matters pertaining to Sanctuary. The membership of the Advisory Board includes volunteers for the community at large that are concerned with youth. and other youth-friendly organizations as Safe Place locations, which display the yellow and black sign. Safe Place locations extend the doors of the local youth service agency or shelter to support teens in crisis situations, creating a safety net for youth. In Fresno County, Safe Place provides immediate access into the Sanctuary Youth Shelter. TXT 4 HELP [Text “Safe” and your current location (street, city, zip)] to 69866.
activities at 3 satellite Drop-In Centers. shelter, crisis intervention, counseling and family reunification. 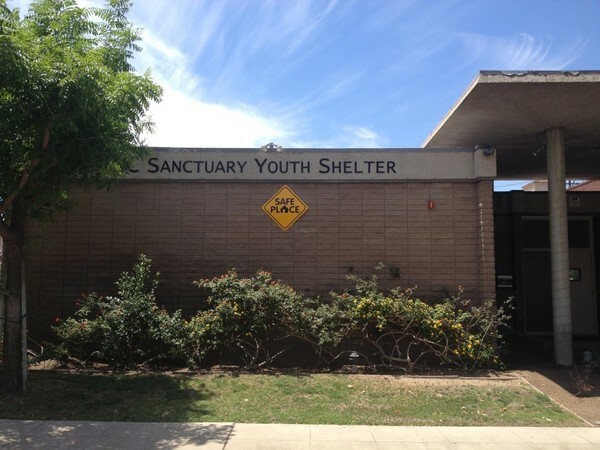 Sanctuary Youth Shelter is a designated Safe Place for youth. supportive services to chronically homeless individuals and/or families. For the fifth consecutive year, Fresno EOC Sanctuary and Youth Services has partnered with Boys & Girls Club of Fresno County in providing deserving youth with a summer job internship. Summer interns have an opportunity to develop work habits, form positive attitudes and gain valuable job skills necessary to enter the work force. A student intern, Alexius Thomas, was placed with Sanctuary Outreach to the Streets (SOS) team for a 120 hour internship through the PG&E's 2016 Summer Jobs Youth Program. Alexius is a recent high school graduate from Ambassador Phillip Sanchez Charter Academy. Alexius learned many soft skills including appropriate workplace communication, time management and good attendance. She also learned how to budget finances, plan events, and practice public speaking. Alexius documented her experience in a journal describing her challenges and successes, strengthening her writing skills and building her self-confidence. As an outreach worker, Alexius conducted street outreach, participated in community outreach events, and organized a summer activity at Sanctuary's Drop-In Center. Alexius plans to attend Fresno City College in the fall semester and pursue a career in nursing. Companies like PG&E and Boys and Girls Club are commendable for implementing the successful summer jobs program that involves and engages youth as equal partners; recognizing, utilizing and enhancing youth’s strengths, and supporting youth and building on their leadership strengths. Thank you for investing in our youth and empowering them through employment. Boys and Girls Clubs of Fresno County are recognized Safe Place sites. In July 2015, Nicholas became homeless and moved into his temporary home, an 8’ X 8’ shed at the Poverello House in west Fresno. Ironically, the shed was located in an area known as Village of Hope. Nicholas fell on hard times as a 23 year-old young man and could not find affordable housing on a limited income. Nicholas made the painful but necessary decision to move into the shed knowing one day he would find something more stable while clinging onto hope. While homeless, Nicholas held onto a job with the Fresno EOC Local Conservation Corps (LCC) working in the recycling department and attending YouthBuild Charter High School while pursuing his high school diploma. Nicholas enjoyed working because it gave him a sense of self-worth and dignity. After eleven months, Nicholas completed his job training at LCC and graduated from high school and that is when he met Sanctuary Outreach to the Streets (SOS) team. 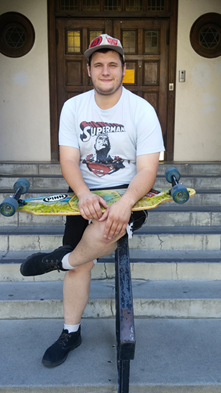 An SOS Outreach Worker helped him transition from homelessness to having secure and safe housing placement with Valley Teen Ranch, a housing partner with Fresno EOC Sanctuary and Youth Services. Today, Nicholas is thriving in a new setting, enrolled at Fresno City College for the Fall semester and plans to pursue a career in forensic science. During his free time, Nicholas enjoys reading science fiction books and playing video games based on history. “ Do or not do, there is no trying,” is how Nicholas lives by his motto that motivates him every day. SOS Outreach Workers are humbled by the fact that they get to help young people like Nicholas succeed each week. Thanks to California Governor’s Office of Emergency Services (Cal OES), Fresno EOC’s Central Valley Against Human Trafficking is one of 11 projects statewide funded to help human trafficking victims recover from trauma and assist with reintegration into society. Through Cal OES Human Trafficking Victim Assistance Program, seven new case manager positions have been created in six agencies serving Fresno, Kern, Kings, Madera, Merced and Tulare counties. 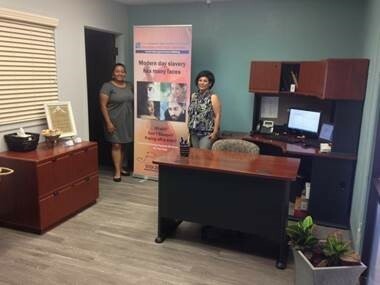 To accommodate expansion, Central Valley Against Human Trafficking’s office has moved and is now located at 1900 Mariposa Mall, Suite #100, Fresno. Please stop by to see our new space! How did you get involved with working with youth? "I started out as a volunteer coach at a middle school in Merced at 19. After moving to Fresno and working full-time in retail sales, I joined Fresno EOC working part-time as a home care specialist concurrently with my full-time retail job. In 1995 I quit retail to work at Fresno EOC Sanctuary and Youth Services full-time, and have been a part of the Sanctuary ever since." Describe an AFLP case that has greatly influenced you? ​"There are many but …three years ago I had a client who had a learning disability (an audio processing disorder) who received her certificate of completion from high school. She was determined to get her high school diploma and achieved that a year ago. She also recently completed a medical assistant program – something she fought hard to do. Although she has not been in AFLP for two years, she has kept in touch and regularly shares her successes with me. It always reminds me to 'Never give up, never surrender!'" -Favorite Childhood memory: Spending time with my father at the airport watching planes take off and land. -What is something we may not know about you? I like classic muscle cars. For over 24 years, Sanctuary has operated projects designed to end homelessness, provide immediate assistance or assist with important life changes. Currently, nine projects are available for individuals and families needing help and with nowhere else to turn. Sanctuary’s Transitional Living Center is one such project. 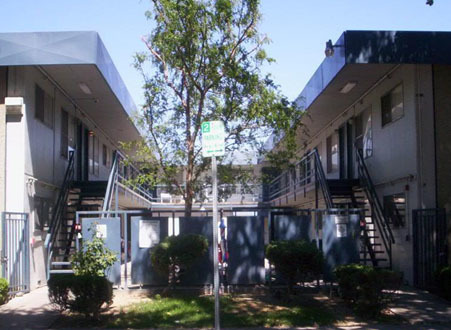 Sanctuary’s Transitional Living Centers have been in operation since 1999 with the goal to provide housing and case-managed supportive services to move homeless youth populations into long-term independent living and appropriate permanent/supportive housing. Youth complete a series of phases to promote the development of independent living skills to ensure their long-term success and achieve self-sufficiency. TLC services youth, ages 16-24, who are without any viable means of support or housing available to them, due to the lack of a positive permanent living environment. One success story comes from an 18 years old, Francisco was at a vulnerable point in his life. He began using drugs, which led him on a road of criminal activity and incarceration on several occasions. His family life was torn by his problems. Meanwhile, his family struggled financially and eventually was evicted from their home. Young Francisco went to stay with his uncle. Four months later he was incarcerated for drug possession. This time, he was very close to being sent to prison but instead sentenced to a drug rehabilitation program. After eleven months at an inpatient program, he set out to find a job and remain sober. Eventually, he was referred to Sanctuary's TLC. Once there, he received emotional support and guidance. TLC helped him build self-esteem and seek out goals. As for his career goals, Francisco plans to become certified in heating, ventilation and air conditioning, as well as carpentry. He is currently employed and attends Fresno City College. Francisco has learned to be more responsible as he prepares to exit the program and enter permanent housing. “I am grateful for this program and the support it has given me,” said a proud Francisco. ​Sanctuary would like to thank Central Valley SHRM for sponsoring Sanctuary and Youth Services program for their summer community relations project. Members were asked to donate items off the Sanctuary’s wish list for the individuals and families served such as hygiene products and clothing. Donations were delivered to the Sanctuary by the Director of Community Relations. Thank you Human Resources Association for your generous donations and thinking of our program. These donations will go to out needy families and youth alike.